We are excited to celebrate Halloween adult style here at 40NORTH Restaurants. 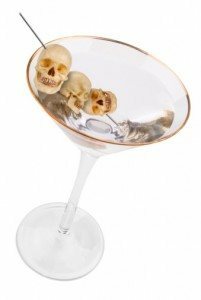 So while we decorate and get ready for our Halloween bashes and “spooktacular” costume parties tonight and tomorrow, our bartenders are busy creating mischievous cocktails to thrill our guests. Here are some of our favorites to share with your guests if you are hosting a ghostly party of your own! This dark rum and ginger beer drink features what looks like eyeballs instead of ice cubes. They’re made from lychees stuffed with brandied cherries! Get the recipe here. This simple martini recipe—which includes dry vermouth and gin—has a surprising twist: picked baby beets on cocktail skewers. The beets actually “bleed” from a “wound” caused by a cocktail spear. Your guests will be equally impressed by your creativity and the “yuck” factor. You’ll find the recipe here. What would Halloween be without a Witch’s Brew? This recipe is a bit more complicated, but it will likely be the hit of your gathering. The drink is made from lime gelatin, boiling water, pineapple juice, chilled lemon-lime soda or ginger ale and chilled vodka. To create some spooky special effects, purchase a black cauldron that can fit a punch bowl. Put some dry ice in the cauldron, then glue a plastic hand to it. The punch bowl is placed on top. Get the recipe here. This recipe involves combining vodka, grapefruit juice, grenadine and HPNOTIQ Harmonie (a purple blend of vodka, fruits, flowers and cognac) in a martini glass. The drink can be garnished with a fake spider for an especially creepy look. You’ll find the recipe here.